We are sorry but we do not accept credit or debit cards for movie tickets and concessions during our movies. The Lucas Area Community Theater is operated by great volunteers which makes it difficult to take credit cards. Sorry for any inconvenience. Thank you for your support! Donate Here to the 21st Annual Alumni Hog Roast for May 25th from 11am - 1pm in the Theater. Donate Here! Thank You! We are currently fundraising towards new digital projector/server and two electronic signs for movie and theater activities advertisement to replace the current changeable letter signs on each side of the front theater sign. Movie tickets are $5 for Adults and $4 for Children 12 & under. Children 3 and under are free. Purchase a 10 movie punch card for $40 for the best movie ticket rate for all ages. 3-D Movie tickets are $6 for Adults and $5 for Children 12 & under. Children 3 and under are free. You may use your movie passes and punch cards at 3-D movies but there will be an extra $1 up charge with Lucas Theater providing the 3-D glasses which are recycleable. Purchase Movie Passes and Concession Passes as gifts to be mailed to you using Paypal. Lucas Area Community Theater now has HEARING IMPAIRED HEADPHONES! 2019 Lucas Area Community Theater Membership Levels. A $15 Membership receives an Adult Movie Pass and Large Combo Pass. A $25 Membership receives 2 Adult Movie Passes and a Large Combo Pass. A $75 Membership receives 2 Adult Movie Passes and a Large Combo Pass and a 10 Movie Punch Card. A $125 Membership receives 2 Adult Movie Passes and a Large Combo Pass and 2- 10 Movie Punch Cards. A $250 Membership receives 2 Adult Movie Passes and a Large Combo Pass and 3- 10 Movie Punch Cards and 1 month newspaper recognition in Lucas/Sylvan News. We now have on screen advertising before each of the movies. Area businesses may contact us at 785-525-7747 or 785-525-6236 about on screen advertising. DIGITAL EQUIPMENT UPGRADE NEEDED BY JUNE OF 2019! OUR DIGITAL EQUIPMENT NEEDS TO BE UPDATED FOR PROJECTION QUALITY AND SECURITY. WE CURRENTLY HAVE THE SERIES 1, BUT FILM COMPANIES WANT US TO UPGRADE TO THE SERIES 3 TO ENSURE ON A QUALITY PRESENTATION AND SECURITY OF THE MOVIES. IF WE ARE UNABLE TO UPGRADE, THEN WE ARE UNABLE TO GET A SERVICE CONTRACT SINCE REPLACEMENT PARTS WILL BE VERY LIMITED. LAST YEAR WHEN OUR SERVER WENT DOWN, WE HAD PROBLEMS FINDING A REPLACEMENT SERVER. THE THEATER BOARD HAS $20,000 IN RESERVE AND IT WILL TAKE ANOTHER $20,000 TO ACCOMPLISH OUR UPGRADE EQUIPMENT GOAL. THANKS TO RECENT DONATIONS WE NOW HAVE $27,000 AND NEED $13,000! 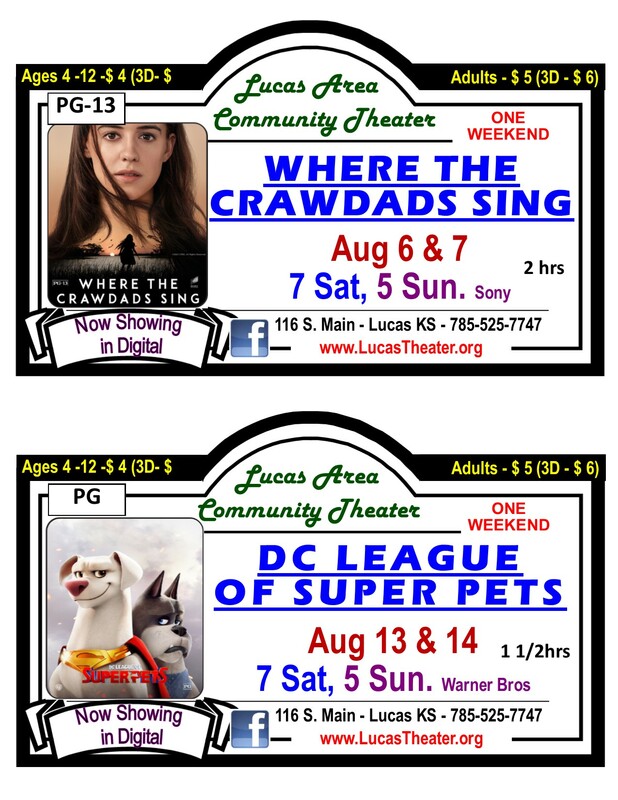 PLEASE CONSIDER A DONATION TO KEEP THE LUCAS AREA COMMUNITY THEATER SHOWING QUALITY FILMS FOR THE AREA COMMUNITY. THANK YOU FOR YOUR SUPPORT! The Lucas Area Community Theater, Inc. would like to Thank Dee Durham for the Post Rock Community Foundation Endowment Fund set up in memory of Bob Durham. The Robert Durham Trust Fund for the Lucas Area Community Theater. Bob was a shrine clown and enjoyed children, so the fund will provide an annual permanent income for the Lucas Theater to use for projects or performances that will enhance the Lucas area community. Now that The Robert Durham Trust Fund has been established, anyone may contribute to the fund at any level of giving. When you make a gift to this endowed fund, the principal of your gift remains for the Lucas Theater and the earnings are used by the Post Rock Community Foundation to make grants that will support the local area communities. Thank You Dee for Building a Legacy of Giving for the Lucas area community. Your donations to the Robert Durham Trust Fund for the Lucas Area Community Theater may be made to the Lucas Area Community Theater or to Post Rock Community Foundation and mailed to Lucas Area Community Theater at P.O. Box 1 in Lucas Kansas 67648. Contributors to the Robert Durham Trust Fund will have their names or memorials placed on the Contribution Wall in the Concession Lobby of the Theater. Donations and Memorials are placed on our Contribution Wall in the Concession Lobby of the Theater. Film Club Level @ $25 to $149. For your convenience, Please use the Paypal donation button to make your Tax Exempt donation. Lucas Area Community Theater, Inc. (LACT) currently consists of a group of eleven people who have renovated the old ISIS Theatre. The theater building had sat vacant for eighteen years until March of 1999 when LACT began renovation. Within eighteen months, LACT and several volunteers had gutted and remodeled the exterior and interior of the theater building with over 4000 hours of volunteer labor. Musical and theatrical performances, cinema productions and educational arts are a few of the multipurpose uses planned for the theater. Completion of the project was December 16th of 2000. Watch for upcoming show dates and live productions! 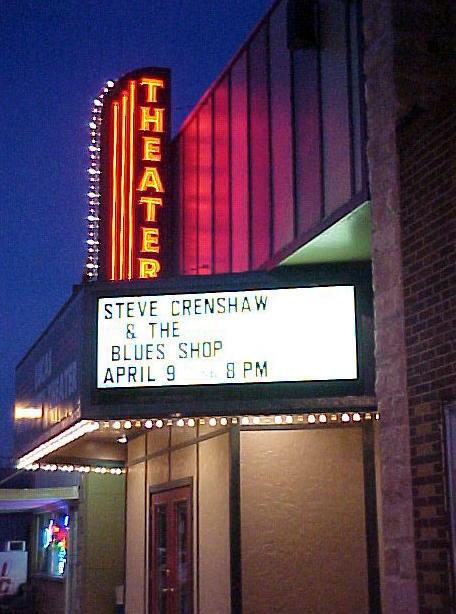 In October of 2005, the Lucas Area Community Theater began work on the Dressing Room/Community Room Addition project through the Kansas Department of Commerce KAN STEP grant. The project was completed in June of 2007. The addition consists of a basement with storage, dressing rooms, bathrooms, utility room, and dance studio. The main floor/community room has bathrooms and kitchenette along with a community room that would hold 50 people for a meeting with equipment to show a powerpoint presentation or DVD movie. The community room can be opened up out onto the stage area for larger dinners for 100 people. 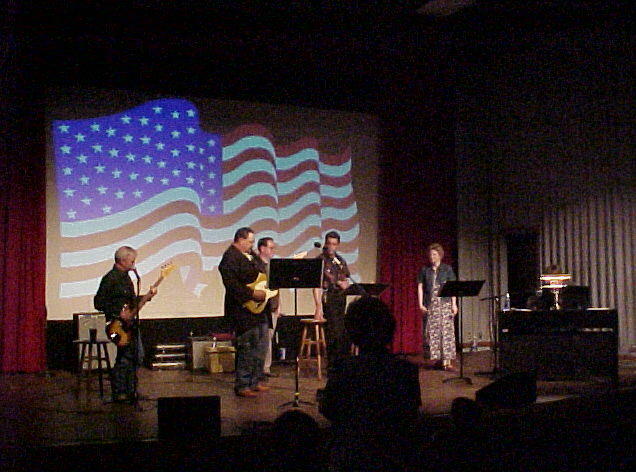 The Lucas Area Community Theater is a community owned theater with a board of directors that administer the daily use of the facility. First Run Movies are shown on Friday, Saturday, and Sunday nights with concessions. The theater has a digital DLP projector with RealD 3D capability and 7.1 Dolby Digital sound system. The facility is handicap accessible and has headphones for the hearing impaired. Special events include Easter and Christmas matinees sponsored by area businesses, exhibit area for art, dance recitals, style revue, and special concerts. The back community room and auditorium may be used for conferences with audio and video capability. Volunteers of all ages from the area community help with projection, sound, concessions, and clean up, giving around 1,200 hours of volunteer time a year to the Lucas Area Community Theater. 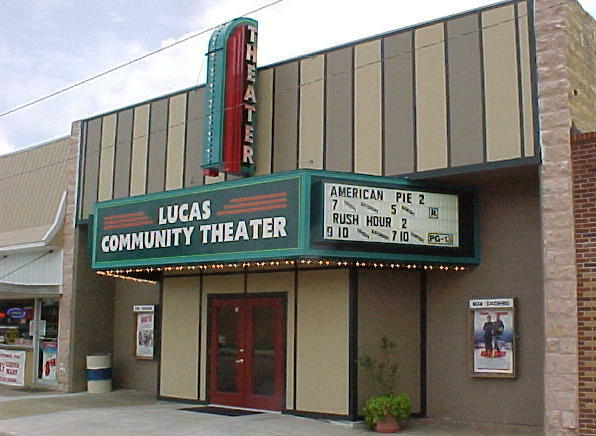 Lucas Area Community Theater, Inc.